Mix all ingredients, work it like dough and make sure press a little tight so it can stick to the skewer. 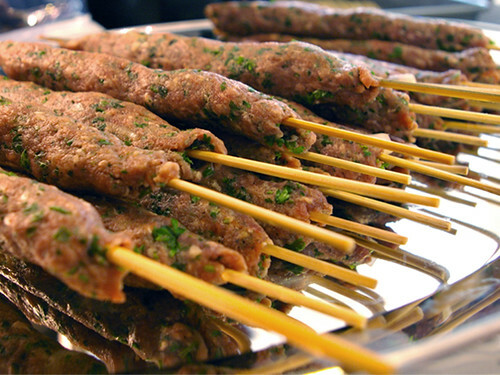 Kababs on a stick. Nice! So delicious! I’ve never actually tried these with beef (usually eat lamb). Can’t wait to try! I haven’t had kofta since I lived in Jordan, I miss it so much! I should definitely try this! The kebobs look great! I’ve been looking for a good recipe for these for a while now. Thanks! Kebabs look fantastic! Love the spicing. These just turned out great! My husband is Iraqi so Ive been trying to learn more middle eastern food, he said they were awesome. I’m happy, thanks for the recipe. Made these for company last night, everyone really liked them. Added a chopped up leftover kabob to an omelette this morning and it was tasty. I figure the remaining two kabobs will be a great addition to lentil soup. Thanks!